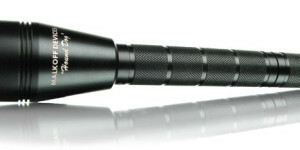 The Malkoff MDC, for Malkoff Daily Carry, series represents the latest addition to the Malkoff Devices family of flashlights. Available in a variety of configurations, the Malkoff MDC provides several options with regard to output, battery type, and finish. The anodized 6061 T6 aluminum head and body of the MDC are also SureFire E-series compatible paving the way for any number of “Lego” opportunities by mixing and matching bodies and bezels from different lights. Unlike the SureFire E-series, the Malkoff MDC includes an integrated tail switch, resulting in a two-piece design. As with other Malkoff lights, markings are kept to a minimum with only the manufacturer’s name on one side of the head and the product name and voltage range on the other. Each light comes equipped with a stainless steel pocket clip which is attached to the tail via Torx screws, allowing bezel-down carry. The MDC shows its family ties to earlier Malkoff products by using the same reflector as the popular M61 LED drop-in module. The LED assembly in the MDC is also fully potted and further protected by springs at both the head and tail. Switching is performed by the reliable McClicky forward clicky switch, allowing easy access to momentary and constant-on output. The MDC does not have reverse-polarity protection if the battery is inserted backwards. The first member of the Malkoff MDC series is configured to run on one primary lithium battery (3.0 volts) or one LiFePO4 rechargeable battery (3.2 volts) and provides three modes of output – high, low, and signal. Use with rechargeable Lithium Ion batteries is not recommended. 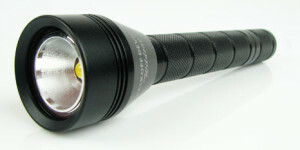 Output levels are 200 lumens on high, 60 lumens on low, and 200 lumens in a flashing “signal” mode. The MDC always turns on in high with the user able to cycle through the remaining modes by subsequent clicks of the switch. If left off for 5 seconds, the light will return to high mode the next time it is turned on. The MDC 1CR123 aluminum body measures 3.75″ in length and 1″ in diameter at the largest part of the head. It is available with Type II bright anodize in black, orange, or red finish. It is also available with the harder Type III anodize in a matte black finish. Retail price ranges from $89.00 for Type II finish to $99.00 for Type III finish. If the MDC CR123 could be compared to a shiny sports car, the SHO version would be the stripped down street racer. Available only with the Type III matte black finish, the SHO has the same dimensions and physical characteristics as its more colorful sibling but it has only a single mode and is rated at 300 lumens, 50% more than the 3 mode version. The MDC SHO 1CR123 retails for $99.00. 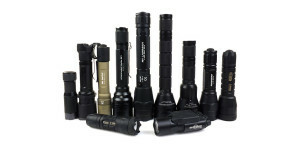 The MDC 1AA is probably the most versatile light of the entire MDC lineup with its broad selection of battery choices. Built to accommodate a AA alkaline battery, the MDC 1AA is slightly longer than its CR123 counterparts, measuring in at 4.5″ in length, and features the same High/Low/Signal interface as the MDC 1CR123. When used with a single AA Alkaline or rechargeable Ni-MH battery, the MDC 1AA is rated to deliver 110 lumens on high, 25 lumens on low, and 110 lumens in signal mode. What sets the MDC 1AA apart from the other members of the MDC family is its ability to run on Lithium-Ion 14500 batteries (AA sized). In this configuration, the MDC AA is rated at a much higher output of 400/325/400 lumens in each of the respective modes. Available in orange with Type II anodize and matte black with Type III anodize, the MDC AA retails for $99.00. All three versions of the MDC feel solid and well constructed. The flared tail, along with the machined grooves and attached pocket clip, provide plenty of grip and the tail switch is easy to use in momentary or constant-on mode. The “cigar grip” feels most comfortable to me when using this light. The MDC bodies have a very smooth finish and are well machined. Although the Malkoff Devices website warns that the anodizing process may produce slight mottling or uneven finish, the color and finish of the three review samples is extremely good. The color on the blue and orange versions is extremely rich and provides an attractive alternative to tactical black lights. Engraved lettering on all samples is crisp and easy to read. The threads mating the head and body engage smoothly and securely with a weatherproof o-ring seal. The MDC can be “locked out”, to prevent accidental activation, by loosening the head a tiny fraction of a turn. With the head fully tightened the battery is securely held in place with no rattle or loss of connection under hard use. The stainless steel deep-carry pocket clip is extremely strong and tight. I was initially concerned the clip would prove hard to use but it has actually become one of my favorites as it literally snaps into place when clipped to a pair of jeans yet is still easy to remove when needed. The clip on one sample may have been a little too tight initially but this was easily taken care of by (very) slightly bending the clip to open it a little more. Although the tail switch is recessed, the MDC will not tailstand with any stability due to the clip extending approximately 1/4″ past the end of the body. All three samples of the MDC produce very smooth and useful beams with a defined center hot spot and plenty of usable spill, as would be expected from their M61 heritage. The output is a very even white, with a very slight cool tint, and will easily reach out over 200 feet. In the following beamshot comparison photos, the lights were positioned 25 yards from the swing. The slider can be used to compare the beams across the full width of the image and there are multiple slides in each box. Runtime tests were performed to see how the MDC variants sustained their output over time. Testing was conducted using a homemade lightbox with measurements captured by an Extech HD400 data-logging lux meter. In the following chart, the 100% value is equal to the MDC AA’s output 30 seconds after turn-on using an Energizer alkaline battery. MDC 1CR123 on 1 x SureFire CR123a – In this setup, the MDC maintained 95% of its initial full output for 59 minutes before stepping down to low mode as the battery voltage decreased. It continued to run at that level for approximately 20 more minutes until it reached a point where it was putting out 3-5 lumens. The MDC was still producing usable light when I ended the test at 90 minutes. 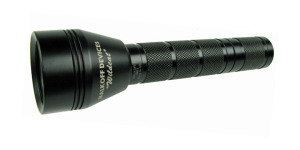 MDC SHO on 1 x SureFire CR123a – The SHO version maintained 90% of its initial output for 30 minutes before it began to step down out of regulation. Like the MDC 1CR123, it continued to run for quite a while afterward and was still producing usable light when I ended the test after 95 minutes. The beamshots and runtime test indicate the outputs of the MDC 1CR123 and the MDC SHO are a little closer than their ratings would indicate. MDC AA on 1 x Energizer Alkaline – The MDC AA maintained flat regulation for approximately 15 minutes before it began to decrease in output. It then continued to run for well over an hour producing lower levels of light. MDC AA on 1 x AW 14500 Li-Ion Rechargeable – In this configuration, the MDC AA more than lived up to its billing by producing over 4 times the peak output of an alkaline battery and running for 30 minutes before the battery’s protection circuit cut the power. When running on Li-Ion rechargeable, the low mode is only slightly lower than high and the signal mode becomes a very rapid flash. MDC AA on 1 x Eneloop Rechargeable – The overall runtime champ by a considerable margin. The Eneloop powered MDC AA maintained dead flat regulation for over 90 minutes before stepping down and was still providing usable output at the two hour mark when I ended the test. When running on primary batteries, the Malkoff MDC is not going to leave anyone unexpectedly stranded without light. As battery voltage decreases, the light provides a nice long taper ensuring plenty of warning to change batteries. The MDC does not provide battery detection so the use of unprotected Li-Ion cells in the MDC AA is not recommended. Overall, the Malkoff MDC series has a lot to offer. Depending upon battery choice, the MDC AA alone runs the gamut from 110 lumens to 400 (or more) with the two CR123 versions filling in the gaps nicely. Pocket clip might cause excessive wear on some fabrics. There is no reverse polarity protection for that one time in 1,000 the battery is inserted backwards. Although the MDC AA handles Li-Ion rechargeable batteries, it loses the effectiveness of the low mode. For many users the signal mode is not useful and is unnecessary. 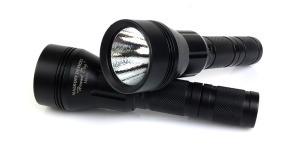 In its various configurations, The Malkoff MDC is a well thought out EDC light and is definitely a keeper. I have primarily carried TIR-equipped SureFire lights such as the E1B (and now EB1) Backup, but the MDC has earned its way into to the rotation. There are a few times that I miss the extra throw of the EB1 but this is offset by the improved usability of the MDC’s beam the other 98% of the time. The inclusion of the strobe/signal mode and lack of true Li-Ion support have been the most consistent complaints heard about the current MDC lineup. However, this situation may change in the near future so be sure to keep an eye on the Malkoff Devices website. 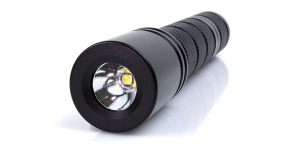 Posted in Flashlight Reviews, Malkoff Reviews and tagged LED Flashlight Reviews, Malkoff. Interesting review, thank you Jim 😉 , I ordered the version Nichia 219B 85+ CRI at Illum.supply. But the HA Tactical XP-G2 model would be fine for me. Any thoughts on the newish Malkoff Turnkey XP-L 2CR123 ? Is it basically the same just more lumen output?